No matter how many rodeo people you talk to, it still boils down to talking about the friendships they’ve made. 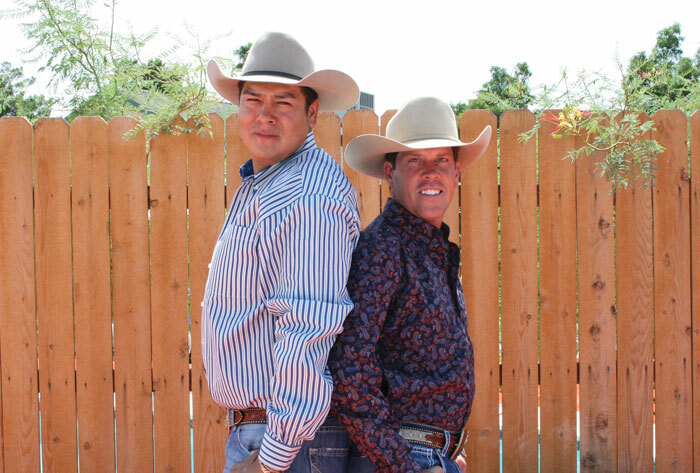 Some of them seem like absolute matches from the start while other friendships seem more improbable, like the friendship between Greg Begay and David Lawson. What on earth could an initially shy Native American who works in a Scottsdale, Arizona casino have in common with an outgoing Anglo horse trainer who lives in California’s Sonoma Valley? It’s the rodeo, of course. The friends met four-and-a-half years ago at a Palm Springs rodeo. They had seen one another around but hadn’t exchanged more than a few words until they danced together one night and really began a conversation. As occasionally happens in the sport, David’s roping partner quit before the San Francisco rodeo and he needed someone quickly. He called Greg who is one of the best ropers around and said that if he’d fly out to San Francisco, David would provide the horses. Because of that experience, they now pair up for all the multiple-participant events. Yet when they compete against each other (and that happens all the time), both say they are determined to win. When an event is over, though, the competitiveness goes away. It’s the rodeo and their passion for it that enabled them to meet but it’s also their mutual desire to help others that stands out when you talk with them, a deeply-held personal value of both men that’s reminiscent of the western pioneer tradition of helping neighbors in need. Greg says it’s a family tradition he grew up with and one of the things that makes his bond with David so strong. They’ve now become such good friends that both say they’re best friends who have blended their lives and families together. David says a lot of people ask if they’ve dated but the answer is no. Their bond is stronger; they’re really brothers from different mothers and fathers, all thanks to the rodeo.